By default, the Nikon D5200 camera captures a single image each time you press the shutter button. You can vary this behavior by changing the Release mode setting. For example, you can set the camera to Self-Timer mode so that you can press the shutter button and then run in front of the camera and be part of the picture. Or you can switch to one of two continuous-release modes, both of which record a burst of images as long as you hold down the shutter button — a great feature for photographing a fast-moving subject. Why Release mode? It’s short for shutter-release mode. Pressing the shutter button tells the camera to release the shutter — an internal light-control mechanism — so that light can strike the image sensor and expose the image. Your choice of Release mode determines when and how that action occurs. You should acquaint yourself with the nuts and bolts of changing the setting: Start by checking the Information display, which contains an icon representing the current Release mode. This figure shows you where to look. The S represents the Single Frame shutter-release option, which produces one picture for each press of the shutter button. 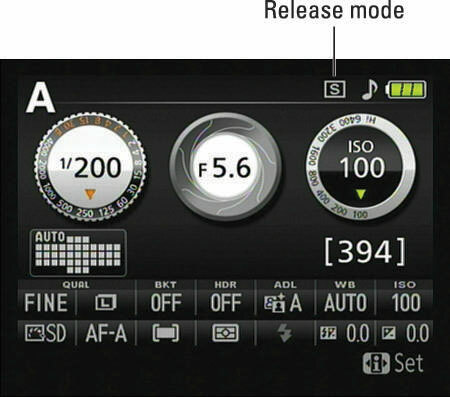 Release Mode button: Press this button, labeled on the left in the figure, to display the screen shown on the right in the figure. The selected setting is highlighted and appears with its name and a photo that’s supposed to suggest the type of image that is appropriate for the setting. Use the Multi Selector to highlight the setting you want to use and then press OK to lock in your choice, exit the selection screen, and return to the Information display. Shooting menu: Scroll to the second page of the menu to find the setting, as shown in this figure.